Hollywood classic Breakfast at Tiffany’s opens with its main protagonist, a black evening gown-donning Holly Golightly, lingering outside the Fifth Avenue flagship of Tiffany & Co. She looks into the shop’s windows, wearing pearls and shades, sipping coffee with a croissant in hand. Little did she imagine that more than 50 years after this iconic scene, the luxury jewellery and speciality retailer would launch an actual café within its store, so anyone can have Breakfast at Tiffany’s. Holly Golightly, played by Audrey Hepburn, in the iconic scene. 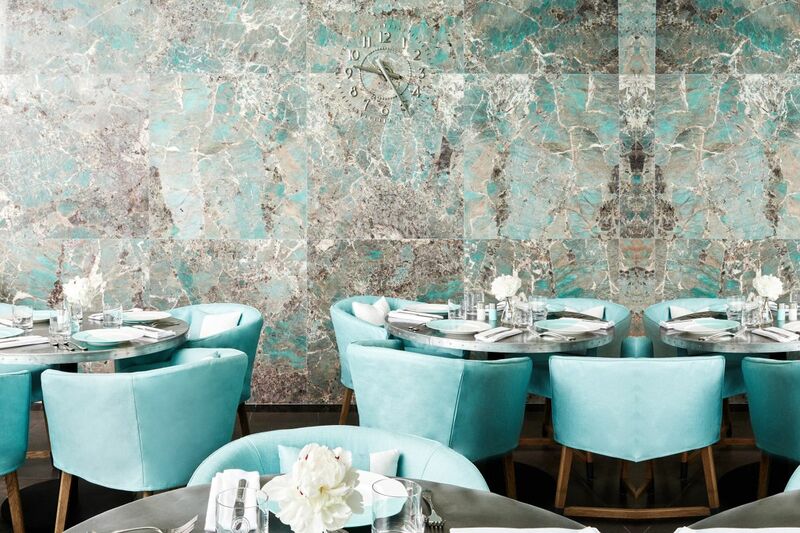 Part of Tiffany & Co.’s newly renovated fourth floor at its New York City flagship store, The Blue Box Café is a stunning space in the signature Tiffany blue, making its debut as the luxury jeweller’s first ever retail dining concept. Tiffany’s latest Home collection is also located on the same floor, including an assortment of vintage books, sterling silver cookware hollowware, a baby boutique and a Tiffany fragrance laboratory. The refreshed spaces are illuminated with natural daylight, with the Tiffany blue against stunning finishes like herringbone marble and amazonite stone. A touch of industrial-like elements are juxtaposed beautifully against a classic setting, blending contemporary touches with an almost old world elegance.